Ah … the four seasons of the Midwest–spring, summer, winter and football. 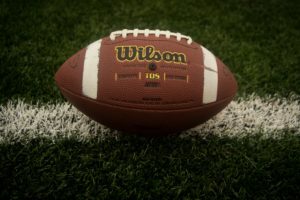 If football season is your personal favorite, you’re probably already thinking about the most important aspect of the game–tailgating. But before you fumble your food, sack your snacks, or commit any other tailgating party fouls, check out these tailgating safety tips and tricks. Keep it on ice. Whether you’re packing up to tailgate at the stadium or cooking at home, you need to keep your food chilled. The safest way to do this is to put a food thermometer in your cooler. Cold food should never sit in temperatures above 45℉ and hot food should never be allowed to sit out for more than an hour before it’s chilled. So grab some extra ice and plan your tailgating menu so that you don’t have more foods that need chilling than you have room for in your cooler. Pack a fire extinguisher. You want your tailgate party to be memorable, but not because your grill caught on fire. Pack a fire extinguisher if you’re tailgating in a parking lot, field, or any place you don’t have access to running water. If you’re grilling at home, make sure you’re keeping an eye on the grill while you’re watching the game to ensure you don’t end up burning your brats, or worse, end up with unexpected fire damage that might require the services of a fire restoration company. Practice good food defense. If you’re packing raw meat in a cooler with other fresh foods, pack the raw meat on the bottom, in a tightly closed plastic bag or container. The juice from raw meat can quickly contaminate other ready-to-eat foods. Also, don’t forget to pack a clean plate to put the cooked meat on. Cool the Coals. If you packed a grill for off-site tailgating, be sure you’ve allowed your coals to cool completely before you dispose of them. Tossing them into a trash bin can easily cause a fire. If you’re grilling your tailgate party food at home, practice good grill safety. 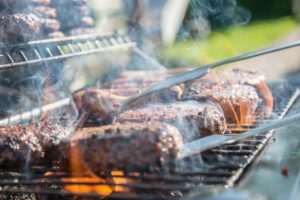 Make sure you’ve turned off the grill well before the kickoff so you don’t have to worry about an unexpected fire at half-time that might cause fire damage to your home. Keep it home. If you’re not planning to head out to the game, you can still have an awesome tailgate party at home. All you really need is some people you love spending time with and some tasty snacks. And, of course, a television. Game on. Hays + Sons is the Official Restoration Company of the Indianapolis Colts. While we hope that you never need our fire restoration services, if you do experience the stress and mess that can be caused by fire damage, call the restoration company the Colts call. It’s good to know that the team of certified and trained fire restoration experts at Hays + Sons are nearby and just a phone call away, 24 hours a day, 7 days a week, 365 days a year. With 140 employees, 120 vehicles, and eight separate locations, Hays + Sons has you covered.